Short Cut: Skip the AllWebLeads review and try their leads with no commitment, no obligation to buy anything, and no worry that your information will be shared or sold to third parties. Says Jamie Oliver, Director, Strategic Alliances, "Our competitive advantage is that our leads are search-generated so the consumer was online looking for insurance. The consumer actually came to us in the mindset to buy insurance, which is why we see the highest close rates in the industry. Our competitors do not specialize in these high quality search leads, and most have to buy leads from us as a result." If All Web Leads Ranks Well? Rank means that the search engines, notably Google, have basically assigned how important your website is relative to other sites in the same niche. Getting a high ranking in the insurance industry is difficult because there are many competitors in the insurance niche. 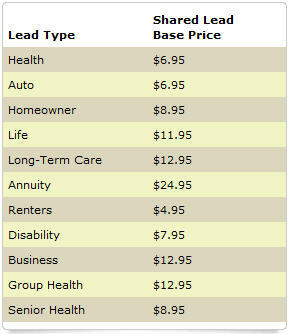 But All Web Leads does well in their rankings for their insurance lead generations site. So when someone is searching for various insurance products they are one of the top 'ranking' sites, if not THE top ranking site. As a result generate uniquely qualified insurance leads. In other words, All Web Leads gets more 'free' or 'organic' traffic from the search engines than their competitors. Get $200.00 In Matched Leads Now! What this basically means is All Web Leads gets more 'free' traffic from the search engines, and they don't have to spend as much on pay per click (PPC) programs, therefore lowering their costs to acquire highly qualified leads. And as a result, the price of their qualified insurance leads is very good. Here is one of their sites: Insurance Lead Generation Site. All Web Leads top competitive advantage is that they generate more leads from qualified prospects who are actively searching for leads, and it is true. Another advantage they underplay is that they guarantee not give a qualified lead to more than 4 other agents. That's the best in the industry, and they follow through on that. All web leads are real time leads as well, which means as soon as it's available, it's coming to you, hot and fresh. "Just a quick note to let you know about the fantastic leads I've been getting from you. I dropped all my other lead vendors. Yesterday I made SEVEN sales for over $4000 in commissions from just your standard leads without filters. Keep up the good work--I am sending all my agents to you!" "AllWebLeads has consistently helped me produce quality business. Since I found AllWebLeads I have written over $1,000,000 dollars in Submitted business. AllWebLeads provides top level service, and a commitment to producing the best leads in the industry. Improve your bottom line buy AllWebLeads." "I have been completely impressed with AllWebLeads Inc. My closing ratio has doubled. From customer service to quality leads all web leads is the only way to go." "All Web Leads has provided me with leads that are accurate, and enabled me to speak with bona fide interested prospects who are actively looking for the financial products I offer. My success rate with All Web Leads has made this lead provider my best source of new clients." "When I started my agency in January 2008 I had a nice amount of leads, but when they ran out in February All Web Leads came to the rescue and got me through. Most of the leads that I receive are clients that are ready to buy insurance, not just shopping. More importantly the clients that I get from All Web Leads are looking for the best company and not just the best price, which creates a multi-line and renewal business." "I just wanted to express my overall satisfaction with the lead program. As you know I am not buying inexpensive leads, but I have found the quality of the leads and the quality of the way you have been working with me to be excellent. Yesterday, I slowed the lead flow down because frankly, I'm swamped with great opportunities primarily from All Web Leads. I would recommend your program to anyone serious about making money." "I just joined and I got the first set of leads. Compared to any other lead source, you are the best HANDS down. I really was impressed with the first 3. Keep up the phenomenal work." "Thank you for emailing me the lead for lead #759293! Whatever the source for this lead - it was a good one. Within two hours of receiving the lead, I met with the client, and wrote their application for health insurance. It was a large sale also. Thank you also for contacting me last Friday. It was nice to speak with a person live. I have a suggestion - I would like to be able to pull my invoice by dates I specify. I am reimbursed based upon my sales for the month by business month vs. calendar month. Thank you again." "I just wanted to let you guys know I am very pleased with the results I have gotten from your leads!! The leads are some of the best quality I get, keep up the good work!!!!" "In the past I have used several different Internet resources and, by far this is the best source that I have. I can think of nothing that can be done to improve it. I only wish had come here several years ago and save the money I spent on netquote leads. Thank you for being there." "I have to say I sure appreciate the fact that a real live person answers my emails, and I can get someone on the phone if I need to. All Web Leads have also provided more ‘real’ leads than other companies I have tried." "You guys have a great lead generating source. The best I've seen in my 5 years of being the business." "I have been using AllWebLeads.com since November 2005 and I have been very happy with the consistent quality, ease of access/use, fair credit policy and most of all our high closing ratio on the leads we receive from your organization. I continue to recommend you to my peers and as of now, you are the only Internet lead provider I use for my agency." "I have been using Internet leads now for six years and have tried four different sources other than the All Web Leads. By far, all Web exceeds all of the other sources. The filtering system is perfect, and the cost is very reasonable. The money I pay per lead is well worth it in the fact that I'm not getting a bunch of garbage leads that are absolutely unworkable due to the filters has made my cost acceptable. In other words, I am not squandering hours and hours calling leads that I shouldn't be calling. Whenever I have had a problem you guys were right on it and took care of it. I can't so all of those other lead sources about a month after I started here and I have encouraged others, including my wife who works with me, to go to AllWeb. Conversely, I have talked to other agents code of going to the other lead sources that I dropped." "We look for every way to get activity in our office, and All Web Leads has done a great job of getting us high quality leads. We have used other lead services in the past, but we aren't interested in just getting in leads.....we don't have the time or resources for practice quoting. We need to see that we get positive, above average results (closing ratio - sales) from our marketing programs, and that is exactly what All Web Leads gives us. I hope this is what you are looking for. Let me know if you need anything else." "I just wanted to take a moment and recommend the outstanding service with the allwebleads you are providing me. So far I have been able to contact and open cases with 50% of the leads I have received and the quality of the information and the quick delivery of the leads has made it easier for me to get in front of the prospect and get the information to them that they are looking for." Get $200.00 In Matched Leads From All Web Leads Now! If you liked this All Web Leads Review you'll like my other marketing and lead generation review articles. Get my Free Referral Mini Course to get updates and a history of articles.